The amount of flash steam generated depends on steam pressure - the pressure in the condensate before it leaves the condensate trap - and the condensate pressure after the trap - the pressure in the condensate return pipe lines. 1) It is common to vent the condensate system to the atmosphere - where the gauge pressure is 0 psig. A condensate system is vented to the surroundings and the pressure in the condensate return system after the steam traps is therefore 0 psig (atmospheric pressure). The steam pressure before the steam traps is 160 psig. According the table above 16.8% of the condensate evaporates as flash steam passing the traps. Note! Without any flash recovery system the energy in the flash steam will be lost to the surroundings. If you prefer SI units - go here! Engineering ToolBox, (2003). Flash Steam Generation - Imperial Units (psig). 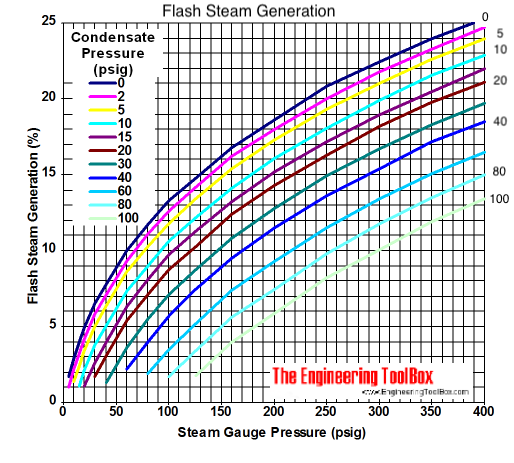 [online] Available at: https://www.engineeringtoolbox.com/flash-steam-generation-d_278.html [Accessed Day Mo. Year].